So how do you enjoy the same joys of Thanksgiving while wearing your braces? To help you navigate the serving tables at your Thanksgiving gatherings this year, we at Carlyn Phucas Orthodontics have a few tips for getting through all three courses. Appetizer Don’ts: crunchy raw vegetables, chips, popcorn, and nuts. This is where it gets a little tricky. 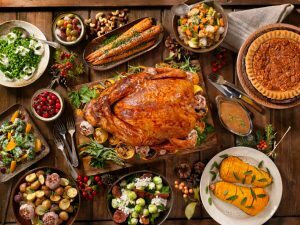 While dessert may be the best part of just about any Thanksgiving dinner, Dr. Carlyn Phucas wants to remind you of your options. If you love pumpkin pie, eat away. If you prefer pecan, you may have to sit this one out. Most pies that include cream or fruit are fine, but avoid cookies that are crunchy or contain nuts. As with every meal, we strongly recommend brushing and flossing your teeth after eating. Pack your oral hygiene kit with you to remove any food debris that may be left between your wires and on your teeth. From our family at Carlyn Phucas Orthodontics to yours, Happy Thanksgiving!